With the busy season not too far away Solihull Fireworks are gearing up for yet another hectic period of professional firework displays and retail sales for Halloween, Diwali and of course Bonfire Night. We are particularly excited also as we’ll finally get to see the new range of products we selected earlier in the year, arriving over the coming weeks. Our fireworks online brochure is vast again and all items can be purchased from the all year round shop also where we stock other high quality brands, including – Fireworks International, Jonathon’s, Total FX, Cosmic, Excelser, Sandling and Black Cat to name a few! Completing our new Ultimate Collection from Fireworks International this year will be three huge single ignitions – Silver Cyclone Dragon, Grand Finale and Pandora’s Box. These 3 pieces offer exceptional quality with professional effects and are priced at the upper end of the scale for the true firework connoisseur looking to really thrill their audiences this November! These ignitions will not be available from our fireworks online catalogue but can be collected direct from our shop. Silver Cyclone Dragon priced at £100.00 is a fantastic option where noise has to be kept to a minimum. With its fifty five second duration this cake produces 100 shots of lower noise effects, including – high rising twisting silver cyclones fired in chasing fans with colour tipped salvo finale. Grand Finale with its loud crackles and bursts also carries an rrp of £100.00 and performs for over thirty seconds with 70 shots of blue time rain mines to gold palm and red glitter willow, coloured dahlias, gold palm to green glitter yellow falling leaves with blue pistil and giant crackling willow. If you have browsed through our fireworks online range you will have already noticed a number of high quality barrages and we feel that Pandora’s Box is a sure fire winner and will be up there with some of our big hitters over the season and beyond. It has a medium to loud noise level and the eighty seconds duration will amaze you with its whistling silver cyclones, mines, comets, salvoes of brocade comets and a spectacular in-built finale. This is the ultimate ending for any display and well worth the £150.00 price tag. So, If you are planning an event over the next few months, why not take a look at our huge fireworks online products and videos that accompany the fireworks. We are also only a phone call away if you should require any help or advice and our team of professionals will be only too happy to help if you should visit us direct at our store. Our office number is 0121 733 3555 and we are open seven days a week. This entry was posted in Uncategorized on September 6, 2013 by Rob Cotterell. Our teams focus on fireworks performance and effects and the summer bank holiday is traditionally a busy time for Solihull Fireworks and this weekend will see many of our teams out at various hotels and venues firing wedding firework displays for our brides and groom customers. Once again, this month has seen us providing professional firework displays for many different events including corporate evenings, birthday parties and various wedding receptions. In one of our recent articles we began to discuss the performance and various effects of the fireworks that our clients can expect to witness and enjoy in our shows and with this article we will be describing the others. 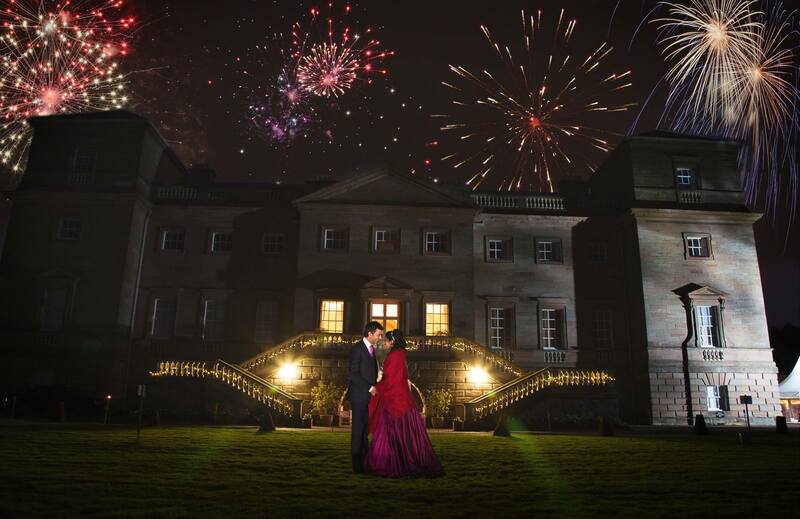 If you are planning your special day and would like some more information about our range of packages and prices please visit our website and click through to our dedicated wedding firework displays page. As previously mentioned roman candles, mines, fountains and gerbs all feature regularly in our display sequences. Making up the remainder of the content are large multi-shot barrages, mortar shells and set-pieces. Multi-shot barrages – also known as cakes are manufactured in a number of different shapes and sizes and provide a multi-array of sky filling bursts and colour. They can perform very rapidly or over a slower duration depending on the amount of shots and fired either straight up or fanned out across the firing site. We also stock a lower noise version for venues that may have some noise concern issues. When designing our range of wedding firework displays, mortar shells are always included especially in the finale where possible. Shells are generally the most spectacular and popular products which are launched from a large tube and climb hundreds of feet until they burst, filling the night sky with a huge kaleidoscope of beauty and colour. Heart shells, which burst into the shape of a gorgeous red heart are another fantastic addition from our display extras and are requested on a regular basis. Set-pieces are a wonderful way to either start or finish your display and enhance your fireworks even more. A glowing red heart with your initials either side in your favourite colours have always been popular with our wedding firework displays as are special messages such as “Thank You” or “Congratulations” Exciting news for 2013 is the addition of a new set-piece – two entwined hearts with a beautiful fountain surround – which is sure to become a big attraction with our brides and grooms. To view all these amazing effects please visit our YouTube channel which can be found on every page of our fireworks online website. This entry was posted in Uncategorized on August 23, 2013 by Rob Cotterell. Corporate Firework Displays – We Entertain You In Style! It’s been a glorious past few weeks and in particular July has been one of the warmest and driest months we have seen for a long time. The feel good factor is back, bbq’s dusted off and we can all finally spend some time enjoying ourselves in the back gardens again! Our fireworks shop has been noticeable busier over the past few weeks with many corporate firework displays being booked and our customers are using this lovely weather to celebrate special occasions with the long, warm evenings now upon us. 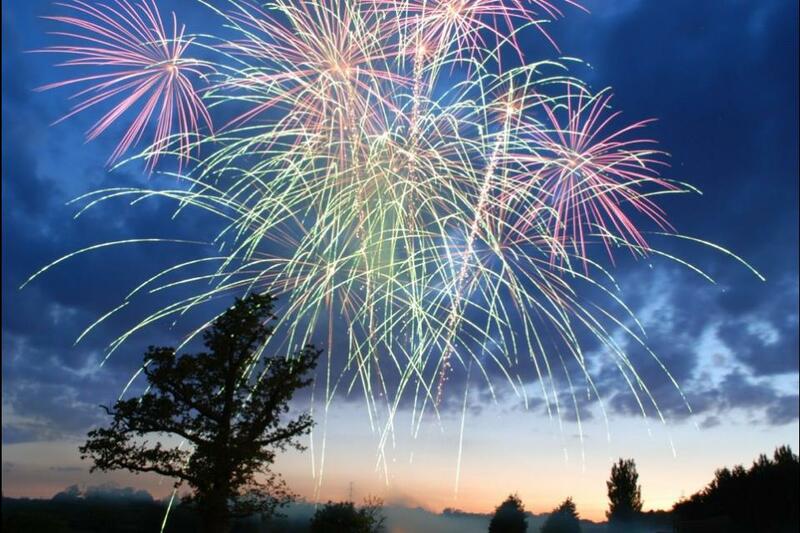 Solihull Fireworks perform corporate firework displays across the Midlands. 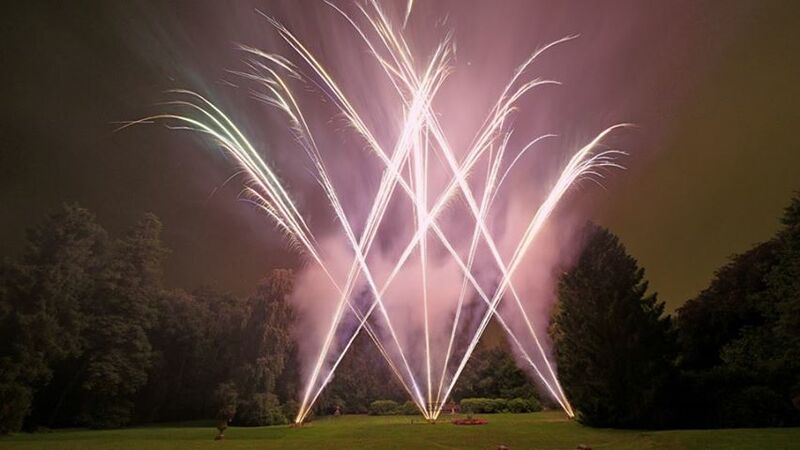 Solihull Fireworks have also been busy providing a number of corporate firework displays for businesses looking to reward their staff and customers at organised summer balls and special functions – a great way of getting everyone together to relax and enjoy a fantastic night of entertainment. One of our most recent displays was for the company Bosch Electricals – the engineering and house hold electrical giant, whose products include automotive components, industrial products and consumer goods, including household appliances and power tools – boasting a worldwide work force of around 303,000 staff! The show itself was larger than usual and had to be carefully designed to a lower noise spec due to the venues location next to the fields of wild deer and other livestock. Many of our corporate firework displays require the company’s logo in the form of a set piece, but this time a huge “THANK YOU” alongside a smiley face was to be lit up as the finale to the evening. The rest of the display was left down to our design team to use their expertise in providing a stunning spectacle which would complement Bosch’s anniversary function even further and wow all their guests attending. The six minute duration lent the opportunity to incorporate a large amount of firework content which consisted of large roman candle fanned sequences; huge multi shot barrages and mega slices spreading spectacularly across the full width of the firing site. As with many of our corporate firework displays, the audience was buoyant throughout and once the final lances of the set pieces had gently faded away, our firing crew received a massive round of applause and pleas for “MORE” After being rather pleased with ourselves, we de-rigged, cleared up and set about planning and looking forward to our next event. In the following days the office received this very complimentary “thank you” email from the venues Events Co-Ordinator. “Our client was delighted with the fireworks last Friday and has asked if I could pass on their sincere thanks for a great performance. On a personal note, can I just say it’s always great to work with you and all your staff, you always deliver and never have any issues. Thanks for being the professionals I expect at my events! To find out more about our corporate firework displays, please feel free to contact us anytime. This entry was posted in Uncategorized on July 27, 2013 by Rob Cotterell. Having worked with the resident group for well over two decades on their highly successful Bonfire Night celebrations, we have been invited, alongside other local businesses to help launch this latest, public spectacle, which will hopefully be a date in many people’s diary for years to come! Our designers have spent many hours choreographing the sequences to the chosen pieces of music, which will see two very different professional firework displays merging into a spectacular finale, and after many months of meetings, planning and the recent spell of warm weather, tickets have been selling well and it is now more than likely that tomorrow night is heading for a sell-out. The gates will open at 6.30pm with the opportunity to bring food and drinks and relax in the gorgeous evening sunshine on a rug or a chair. A bbq stall will be selling the usual delights of burgers, hot dogs and steaks with the bar open for adults to purchase beers, lagers, wines, spirits and soft drinks. The band commences with the music at 8pm and the professional firework displays will be fired at 10pm to coincide with the concerts final performance of Tchaikovsky’s 1812 Overture. Warwickshire band – The Royal Regiment of Fusiliers and The West Midlands Police Band will be performing the live music, with guest vocalists joining in medleys of The Seekers, Carpenters and the all-time classics of Abba. The audience will also participate by waving flags and clapping along to the nation’s favourites of Jerusalem, Rule Britannia and Land of Hope and Glory. Bandmaster Barney Barnes is providing a play list which will appeal to the whole audience with a series of classic favourites and familiar marches alongside popular tracks for the youngsters to dance along to also. Our professional firework displays set to the 1812 Overture will bring a spectacular and memorable finale to the evening and hopefully secure another fantastic evening of entertainment for its return to the park next summer. Tickets can still be brought on the day and the prices are as follows: Adults – £17.50, Under 18s – £10.00, Under 5’s – FREE. Please contact us for more details. Hockley Heath Residents, the Parish Council and Solihull Fireworks very much look forward to seeing you there tomorrow evening! This entry was posted in Uncategorized on July 19, 2013 by Rob Cotterell. One of the most frequently asked questions when couples are enquiring about wedding firework displays is “What can we expect to see in our show?”. Of course, it’s easy for us to respond with a long winded explanation of firework terms and pyrotechnic talk as we have worked in the industry for many years. However for an excited future bride and groom planning their pre nuptials it’s very often the first (and hopefully the last time) they will ever have to arrange and book professional firework displays. Planning your big day takes a lot of organisation and expense, so it’s only natural you will want to know what you are getting for your money. In this article we will be explaining your wedding firework displays content and the beautiful effects you can expect to be witnessing in front of your very own eyes. Our high quality stocks are sourced and carefully chosen from around the world to ensure customers get to view the very finest pyrotechnics. Category 4 material is featured in all shows and is for professional use only – the general public are only allowed to purchase products up to Category 3, so consequently you will get to enjoy fireworks often admired at larger public events. Once a display package and wedding venue has been booked, our team of experts can then start to work on designing your wedding firework displays sequences. The many types of fireworks incorporated include – mines, roman candles, fountains, multi shot barrages (cakes), mortar shells and on occasions fire writing set pieces. Roman candles are traditionally positioned to create a fanned or cross over visual, contain large colour stars which fire at regular intervals and are usually designed in pairs, threes or fives. Larger candles can contain bombettes – smaller shells rather than stars. Mines – a one shot lower level effect, fired from a mortar tube ejects a column of stars into the sky and also contain small shells, serpents and small reports which feature regularly in our wedding firework displays and are very effective in pyro musicals for perfect timing of cues choreographed to musical scores. Fountains also known as gerbs produce a beautiful jet of sparks with a duration of between fifteen to sixty seconds. Colours range from Gold, through to a moderately bright yellow to a dazzling white and are often chosen in displays to compliment a glowing red heart and initials set piece, highlight a favorite colour or promote the happy couples wedding theme. More articles regarding other firework types and effects will be appearing very soon so please visit our news page over the next few weeks to find out more. If you are planning your special day and should require any further information about our gorgeous display packages, you can either visit our fireworks online website or why not give us a call on the office number and speak with one of our friendly members of staff who are always happy to help. This entry was posted in Uncategorized on June 26, 2013 by Rob Cotterell. As well as providing amazing professional firework displays for many events nationwide, Solihull fireworks stock a large range of fireworks for sale in birmingham, both online or direct from our all year round shop. We are based at 353 Haslucks Green Road, Shirley, Solihull, nr Birmingham, B90 2NG, very handily located, making it very easy for you to reach us. As discussed in previous articles, our number of products will continue to grow this year, complementing further the popular fireworks we have sold in recent times. As a trusted local business, it has always been our priority to sell high quality items, offering total customer satisfaction and building a long term relationship with our existing clients as well as new customers visiting us for the very first time. Our fireworks for sale range will now include even more multi shot barrages and single ignitions, which is sure to please our regulars! Fine & Dandy is destined to be a hit with its 18 shots and 35 seconds of stunning blue bursts with a light crackling, changing palms and time rain effects – all this for a very reasonable £17.99. Moving up a few notches is Vampire Fire – a fanned barrage with 54 Z firing effects including brocades, white strobe, blue and lemon bursts with time rain, all fired over 40 seconds with an RRP of £54.99, making it a great addition to any celebration. Ticking Time Bomb is another single ignition making an introduction to our fireworks for sale collection and to the 500 shot family also. Always a big seller because of the amount of bursts and variety on offer, this cake will produce 100 seconds of multicolour comets, crackling comets, whistles, changing to coloured palms, star bursts and time rain, creating a superb long lasting display with its wide array of colours and effects. At £69.99 this is sure to give similar fireworks already out there some serious competition, including one of our old favourites – Masters of the Universe. We will be posting even more details about our 2013 products and the rest of our fireworks for sale range to our news page over the coming weeks, but in the meantime, if you should require any further information, please visit our fireworks online website or why not come down and see us at the shop where our team of experts will be on hand to help and advise you on the most suitable items for your special occasion. 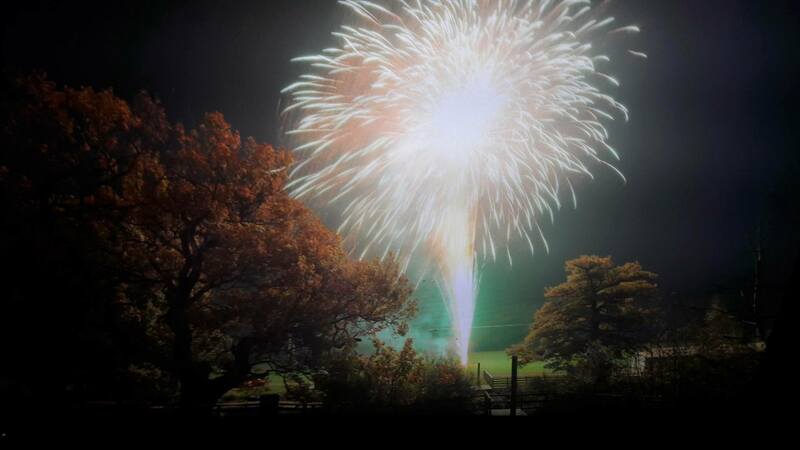 You can also watch Solihull Fireworks’ videos on our YouTube channel from the comfort of your own home. This entry was posted in Uncategorized on June 17, 2013 by Rob Cotterell.